The old school of dentistry considers a tooth saved after a root canal procedure has been performed. It is true that a tooth can survive this procedure for many years, maybe even the rest of the life. But looking at it a bit closer this perspective does not quite hold true. 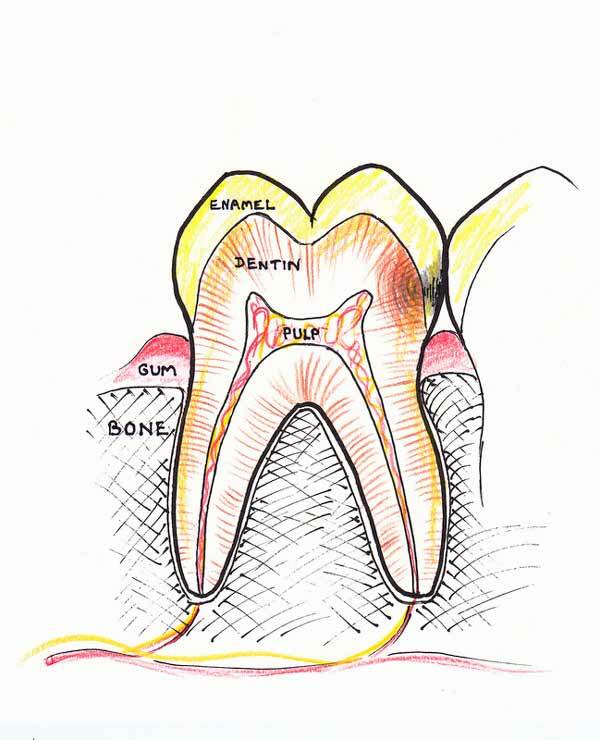 Although the outer shell seems to be hard as an inanimate object the tooth is a living part of the body. 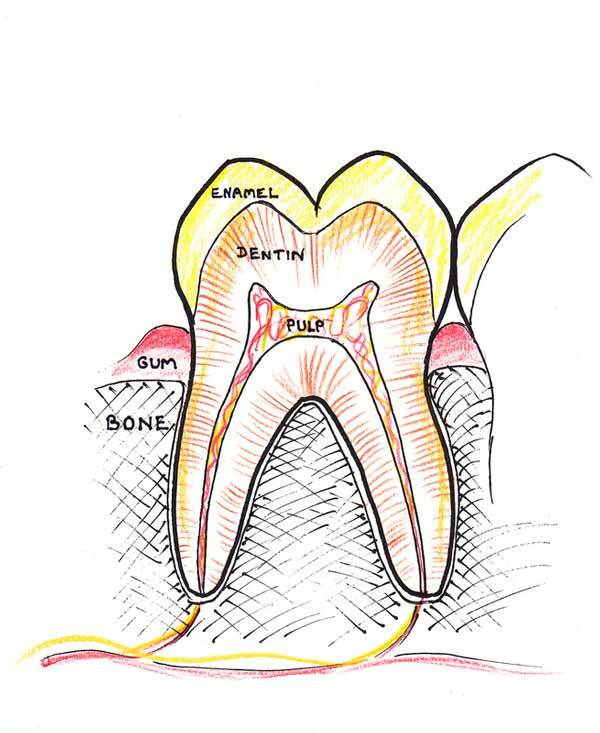 Fact is that the inner parts of the tooth contains living tissue that needs to be nourished to stay healthy. 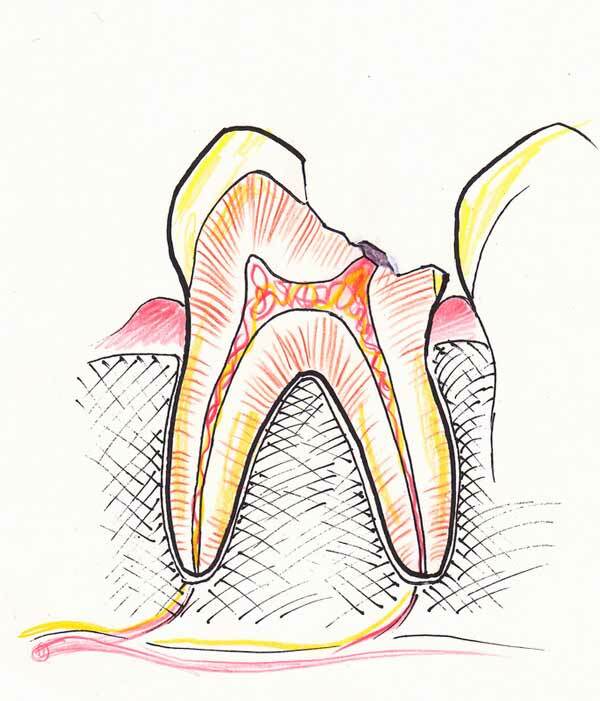 Once the root canal procedure is performed, removing nerve and blood vessels and filling the now empty cavity with an inanimate substance, the tooth indeed becomes an object that is no longer connected to body fluids that make it a functioning part of the body. It has become a dead object that is no longer renewed and protected by the body’s defenses. Bacteria entering through the tiniest cracks might cause persistent infections because there are no blood vessels any longer that would bring white blood cells to fight that infection. 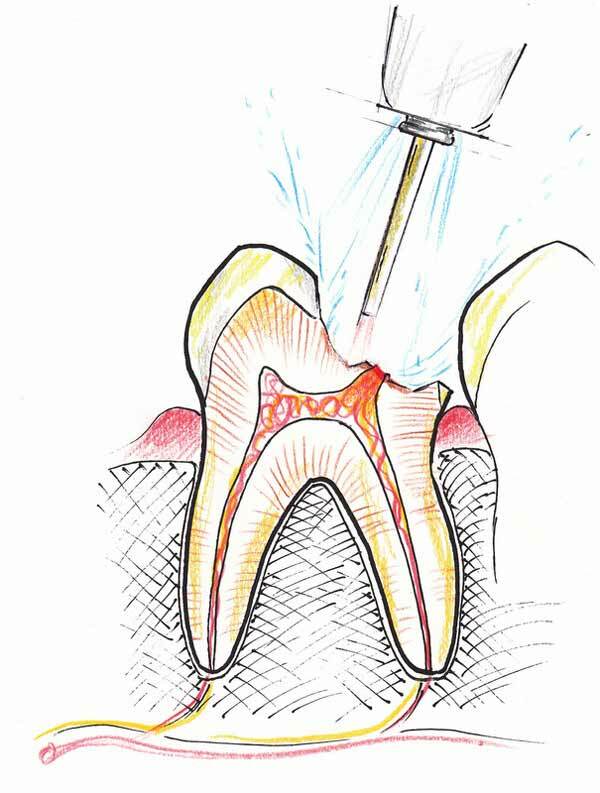 Therefore a root canal should be only a very last resort and every effort should be made to save the inner living part of the tooth – the root canal. The direct cap procedure is such an effort. 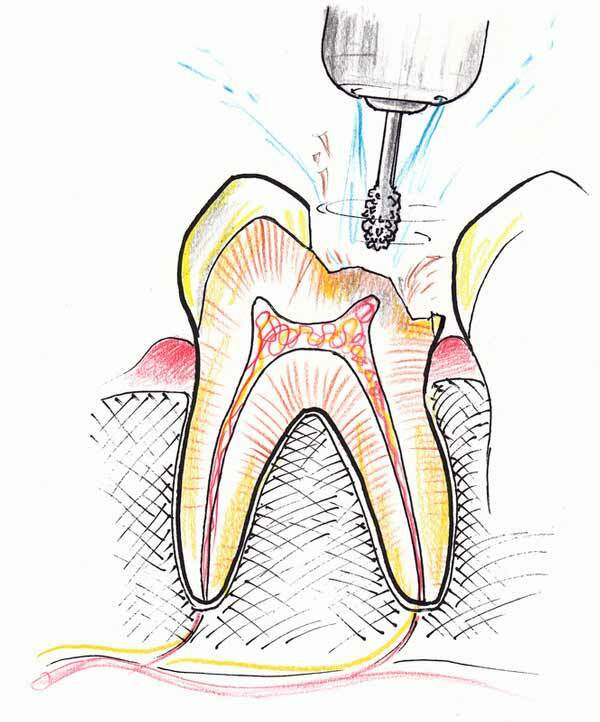 The following illustrations by Dr. Sarkissian demonstrate this procedure. 1. HEALTHY TOOTH: A healthy tooth is covered by a shell of enamel, the hardest substance in the body. It is a complex organ comprised of all three embryological layers. 2. 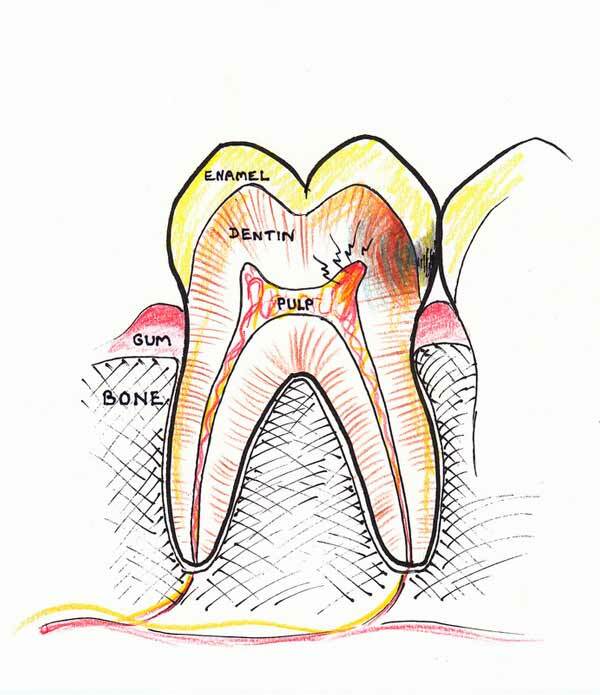 CAVITY FORMATION – EARLY STAGE: A cavity starts when bacteria in plaque produce acids which eat away at the surface of the enamel. 3. 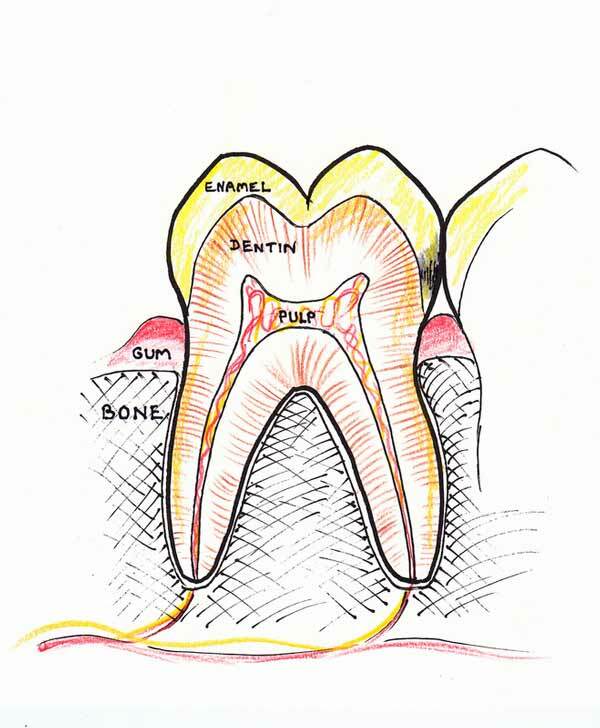 CAVITY FORMATION – DENTINE INVASION: As the cavity penetrates the softer dentine, it spreads like a wave and infects the microscopic tubes of this live tissue. 4. 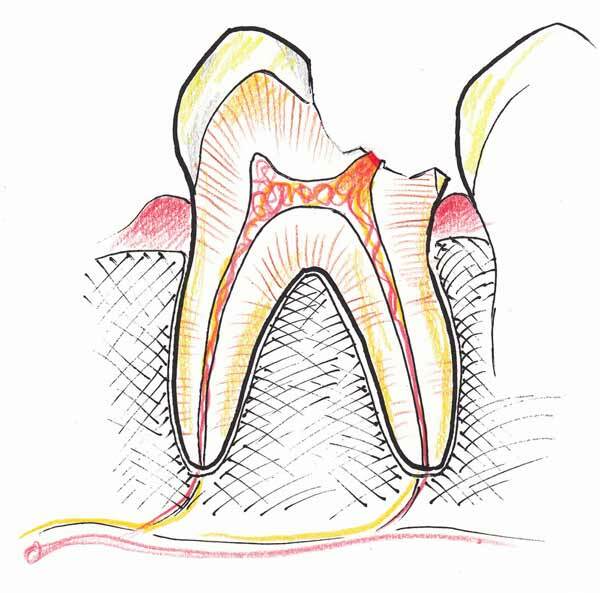 CAVITY FORMATION – DEEP DECAY: Very soon it approaches the nerve chamber, or the pulp, causing an inflammation which at this stage is reversible. This is when one feels mild pain or heightened sensitivity to sweets and cold. 5. DRILLING OUT GROSS DECAY: Treatment is initiated by removing the outer layers of decay with a slow drill. 6. LASER EXCAVATION AND DECONTAMINATION: The deep layers of decay are removed with the Waterlase® at lower settings, to avoid trauma to the nerve. There is no mechanical insult to the nerve, such as vibration, smearing or heat, which is the case when using drills. 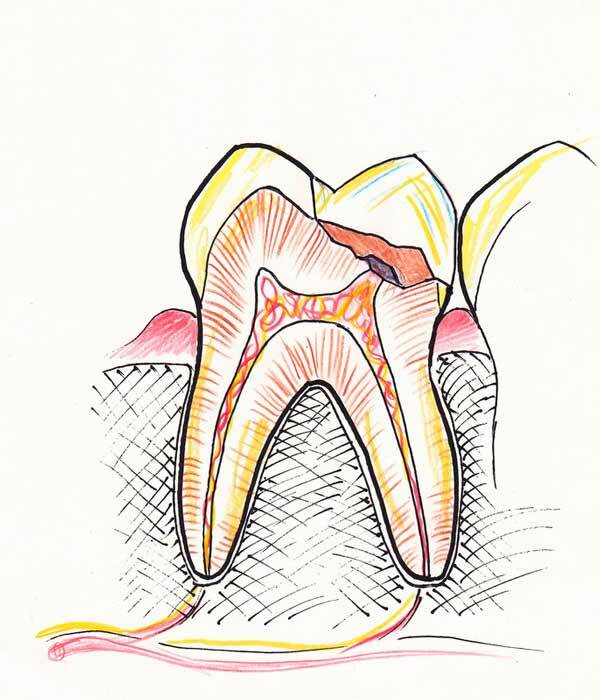 The infected dentine is thus removed completely, resulting many times in an exposure of the pulp. 7. EXPOSED PULP: If the nerve (pulp) is still healthy, it may bleed slightly. At this stage the exposure is treated like a wound. It is gently irrigated with hydrogen peroxide, followed with an isotonic homeopathic remedy. 8. DIRECT CAP: The exposure is gently covered with MTA, a cement well known for its biocompatibility and ability to preserve vitality of tissues with which it comes into contact. 9. CORE BUILDUP: The remaining cavity is then lined with a self-priming bonding agent without disturbing the MTA. After drying, the whole dentine surface is built up with a core of a flowable composite or compomer. 10. FINAL RESTORATION: The tooth is restored with an esthetic, tooth-colored bonded restoration, preferably an indirect porcelain inlay or onlay. The biomimetic principle is followed, which means that each part of the tooth that was restored, functionally mimics the biological tissue it is replacing. Did you know this about the Enamel of your Teeth? This entry was posted in Education, Laser, Repair, Root Canal by Admin. Bookmark the permalink. Tooth #31 abscessed and reduced with antibiotics. Can laser direct cap still be performed. What is out of pocket cost for this procedure? We sure hope that you find a dentist that will see you as a whole person and not just a set of teeth.